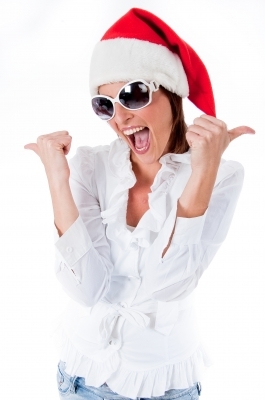 Stress-less this Holiday season with this fun tip from Milford CT Hypnotist Joann Dunsing. Hypnosis is simply a state of relaxation. And in that state you can make positive changes in your life. We go in and out of hypnosis all day long and we even experience a state of hypnosis as we fall asleep at night. You can use that bedtime hypnosis state to picture this holiday season with a twist you would find more favorable. It’s not so much about what is really going on around us that is stressful, it is how we perceive those events. It’s really about the programs or the movies or the thoughts that we have running around inside our head that really makes it soooo stress-filled. When you change your internal programs, or movies, or thoughts you will enjoy a different outcome. Really! First, pick something about the holidays that you find stress-filled. Maybe it’s the uncle who just doesn’t have the social graces to behave in “appropriate” ways. Or maybe you wonder how you will accomplish your ‘to do’ without losing your lost nerve. Think about this particular stressor in great detail by bringing in all five of your senses; sight, sound, smell, touch, and even taste or imagined taste. Now think about the different outcome that you would prefer, again bringing in all five senses; what would it look like, sound like, smell like, feel like and even an imagine test (sweet vs sour). As you fall asleep tonight focus your mind on the twist you would find more favorable; bringing in all five senses. Create, imagine, picture, pretend the movie or the thoughts just the way you would want them. Make it a comedy if you have to. Have fun with it!! Do this exercise for seven consecutive nights and then check out how you feel. Are you still as stress-filled? Are you beginning to find the humor in it? Are you realizing it’s just a thought and a thought can be changed? Make any necessary adjustments to really get the movie the way you want it . Remember, you are the directory of the movies running inside your head. When the holiday arrives you may find yourself more compassionate toward that uncle’s behavior. Or because you imagined yourself getting through that to do list you may find you accomplished it in a calm and confident way.